If you are not here now... you should be..
On the cooler days we can still go fishing.. Linda and Lisa had a blast catching lady fish and sight fishing black tip sharks... Even got some shots at 4 foot cudas laying in some shallow warm up flats.. Unfortunately it was the last day of thier vacation... back to a foot of snow in Michigan the next day..
Capt. 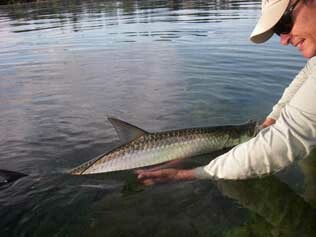 Jack Teauge releasing a baby tarpon we got on a gurgler New Years Day 2009.. 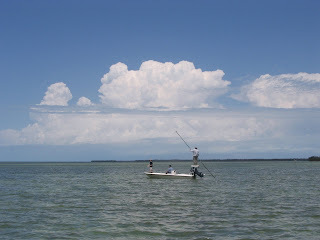 Fishing with Jack again tomorrow, weather looks good for tarpon..